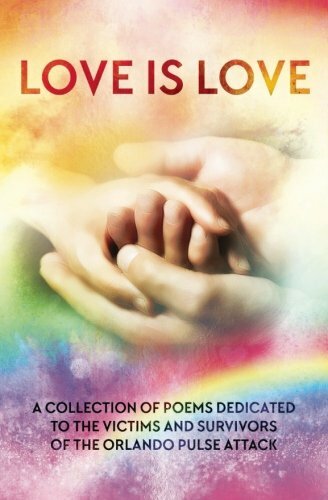 LOVE IS LOVE Poetry Anthology A collection of poems written by over fifty authors in aid of the victims and survivors of the Orlando Pulse Attack. On June 12, 2016, the most horrendous mass shooting in US history and an unfathomable act of hate was directed at the LGBT community in Orlando. The horror of this tragedy reverberated around the world, leaving millions shocked and appalled at the senseless violence that destroyed so many innocent lives. In a display of solidarity with the victims and survivors of the Pulse nightclub shooting, a group of LGBTQ+ and straight allies, from all across the globe, came together to produce a collection of poems in celebration of love and acceptance. The resulting Love is Love Poetry Anthology is dedicated to the families and victims of the shooting and all proceeds of this work will be donated to Equality Florida’s Pulse Victims Fund. In this small way, the authors, along with the readers who purchase this work, seek to contribute to the lives of those who still suffer from the consequences of the malice directed toward them, and offer some positivity and compassion in the face of such bigotry. I was excited to finally see this book out. I know so many of the authors of the poems and couldn't wait to read what they'd written. Some of the poems made me laugh, some made me cry, some just made me shout. I would highly recommend this great book and of course it's even better that by buying it you're supporting an equally good cause. Thank you to all the authors, and behind the scenes people, who donated their time and talents to bring us this great product. Previous entry Poetry Call In Aid Of The Orlando Families/survivors. . I am afraid there is no paperback in India and I don't have Kindle or proper phone to download an e-book. I downloaded the Kindle version .. some good poems in there. Thanks for all you did to help getting the message to us Caz.. Your poem is lovely Emi. I'm with Reader Emi, your poem shone just as bright as all the others. Emi, check your pms. I think I've managed to send you a photo of your poem from my printed copy.